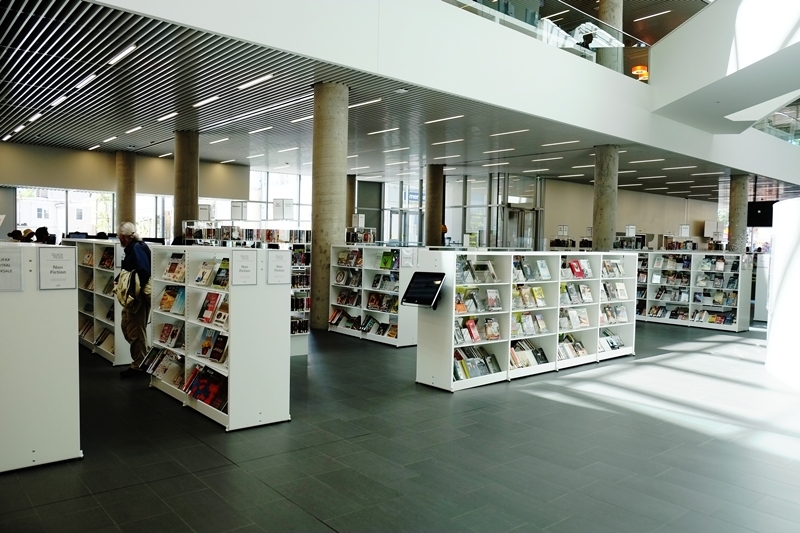 This week we’re visiting the Halifax Central Library. 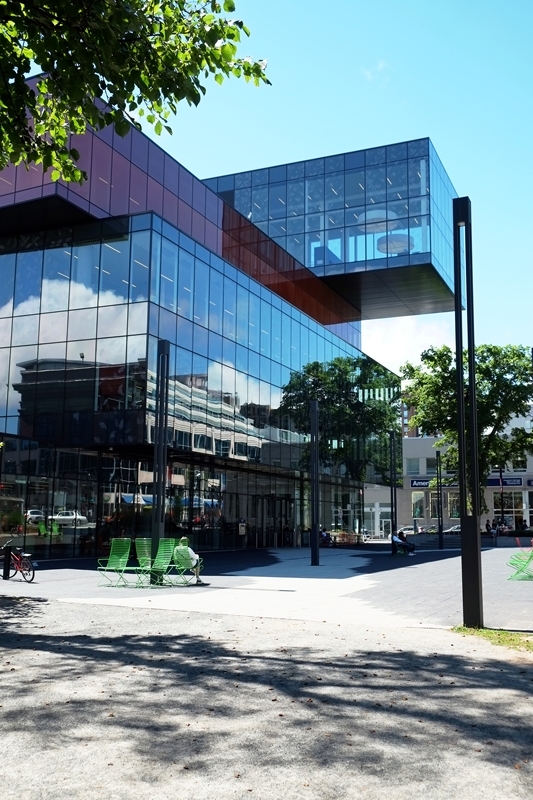 Located kitty corner to the Halifax Memorial Library (the old library), it’s one of the newest buildings in the downtown core, opened to much excitement and anticipation on December 13, 2014. Welcome to week 294 (9/22/2016) of Travel Photo Thursday. I’m sorry to have missed last week. I came down with a miserable cold, which is still lingering. Let’s have a look at this fab building and a welcome addition to our city. If you missed week 293; The Nova Center, check it out here. Here’s a photo of our old library, and it seems like it has always been old! 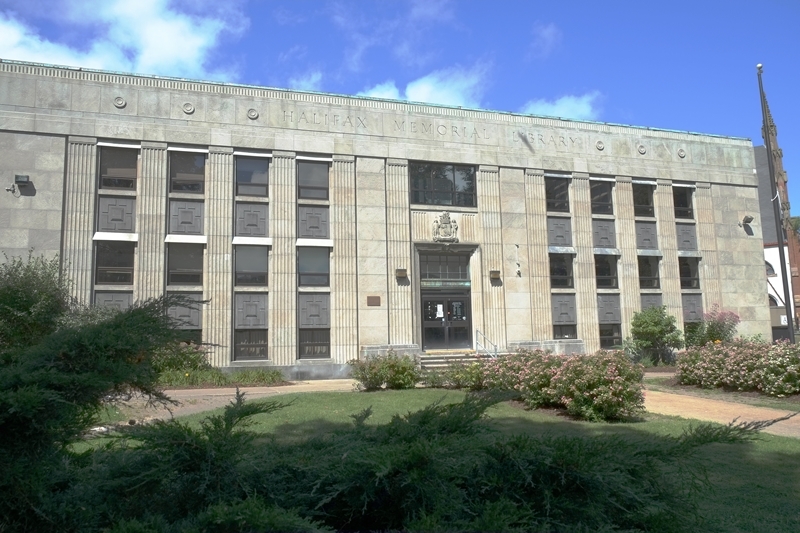 The building opened in 1951 as a memorial to World War casualties. The staff here did a great job of offering a plethora of useful services to the public in a crowded and dusty space. The statue of Winston Churchill is still outside. I’m not sure what is going to happen to the building or Winston. For the moment, it’s empty, and Sir Churchill seems to be holding down the fort. 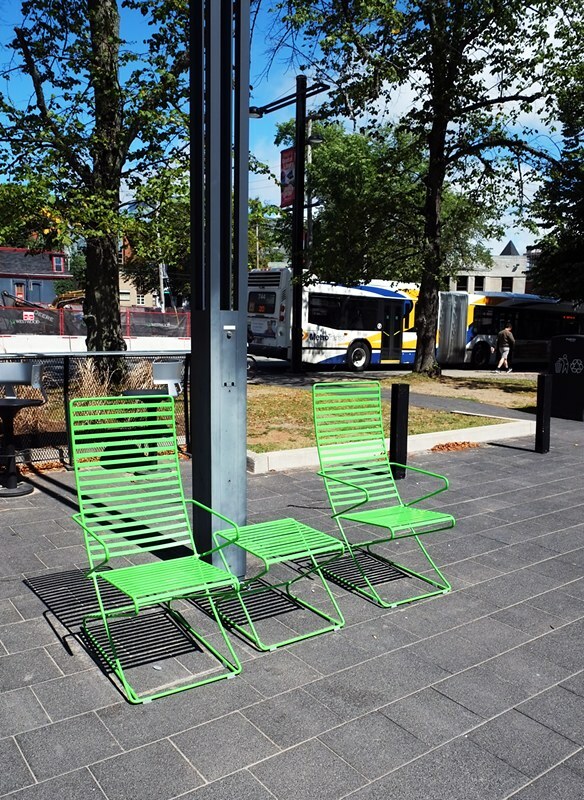 The new library is kitty corner to the old library on Halifax’s Spring Garden Road, the longest shopping street east of St Catherine’s Street in Montreal. A local architecture firm, Fowler Bauld and Mitchell partnered with the international firm Schmidt Hammer Lassen to bring the building to reality. They were helped along with this vision statement from city residents. An active part of daily life in Halifax where people connect with one another and work collaboratively and individually. A resource supporting lifelong learning, professional development, and personal growth. A new approach to traditional library services reflecting developments in technology and different learning styles. 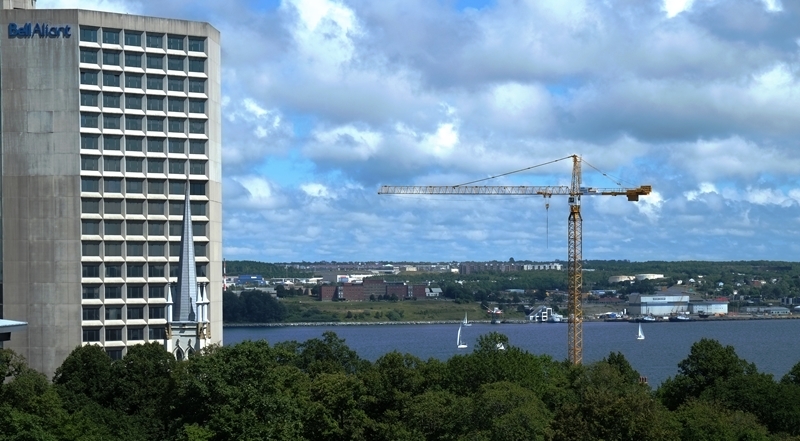 A vibrant part of Halifax’s rich cultural, educational, and civic resources. A welcoming environment where citizens feel empowered and enlightened by the provision of knowledge and their own learning experiences. An avenue of real-time access to collections and resources. I love that they kept that beautiful, huge tree! Lot’s of beautiful space and seating to relax and read outside. During the week the square is full of people. It was a little quieter on this Sunday morning. I’m sure that it got busier as the day wore on. This colorful mural covers the wall behind the circulation desk on the main floor. Each block looks like a book cover and contains a message or a photo from a city resident. I love the idea! Floors 2 through 5 of the Halifax Central Library are home to offices, meeting rooms, and of course book stacks. 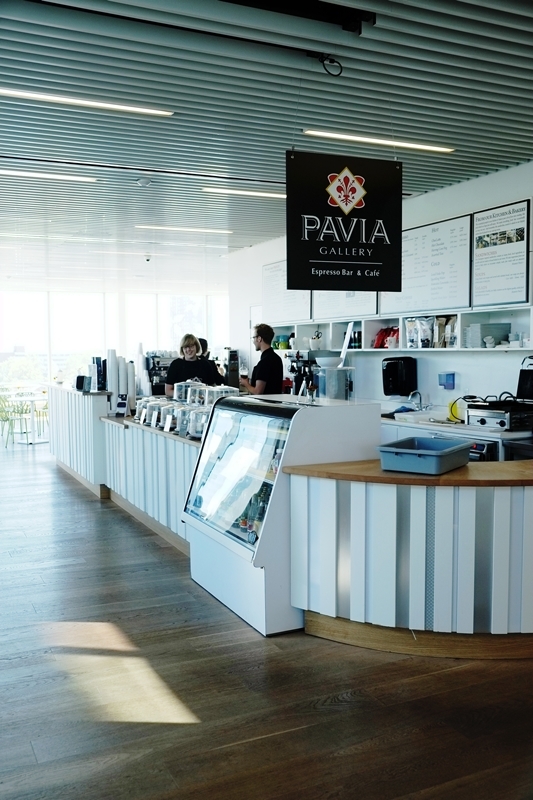 The fifth floor contains a cafe (and on the first floor) where you can purchase drinks, sweets, soup and sandwiches. Prices are reasonable, and the food is tasty. Also, the staff is super friendly! 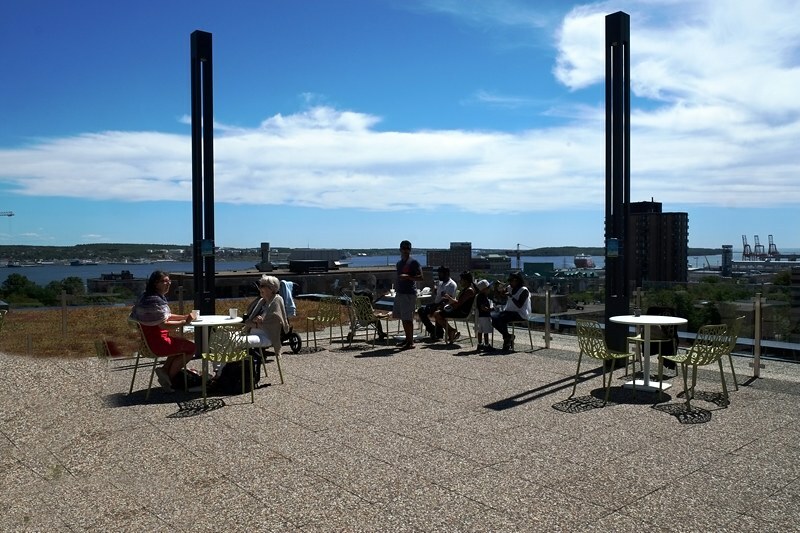 When the weather is nice the 5th-floor patio is open for patrons to enjoy the harbor views with their coffee or lunch. I went to work in the Bell Alliant building after I graduated university. Back then, it was Maritime Tel and Tel and my first job there was as a Library Assistant in their business library. Libraries are in my blood! 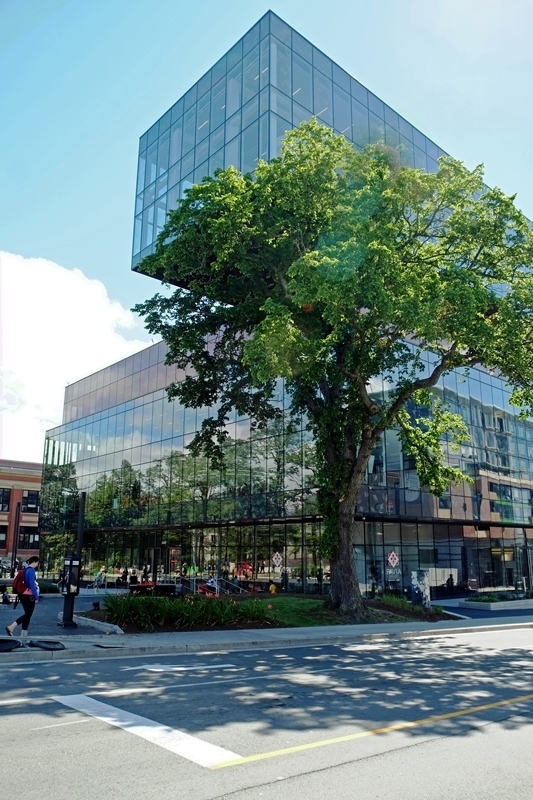 If you’re interested in learning more about the Halifax Central Library, check out the two links below. Don’t forget to visit when you’re in town! After you finish at the library, it’s just a quick stroll to the Halifax Public Gardens! Hi Jackie! Thanks, and I am finally feeling good again. I don’t think I’ve ever had a cold so early in the season. Fingers crossed that I’ve “paid my dues” and no more this fall or winter (haha). I think this will become a tourist attraction as well. It’s close to so many tourist attraction, and I think people will be curious, and the views from the 5th floor are lovely. The cafes should also draw people in. I love this new building but then I love libraries too. When I started work at BMO we had a business library too. With the internet I don’t think that is a position any longer in companies. Hi Jackie. Yes, a lot of corporate libraries have shut down, but there are still a few around. That looks like a stunning library most cities would be jealous about. Shame about the old abandoned library building! It should be put to some community use soon or it will deteriorate very quickly (like empty houses do). Thanks for publishing this #TPThursday post. Hi Juergen. I’m with you. I really want to see them put the building to good use. Since it is a war memorial, hopefully the city council will show some respect. What a building! I like the contrast between the old and the new structures. It is great that the city developed a project based on the community needs. It feels a pleasure to visit the new library. Hi Ruth! Yes, refreshing that the city’s residents had a say. It was a pleasure to visit! 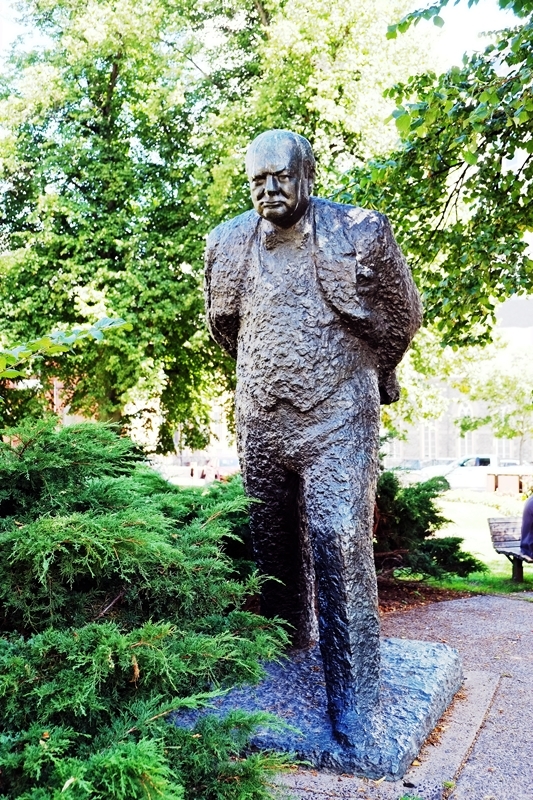 I’m interested to see a statue of Winston Churchill and learn what the relevance is to Halifax and the old library? 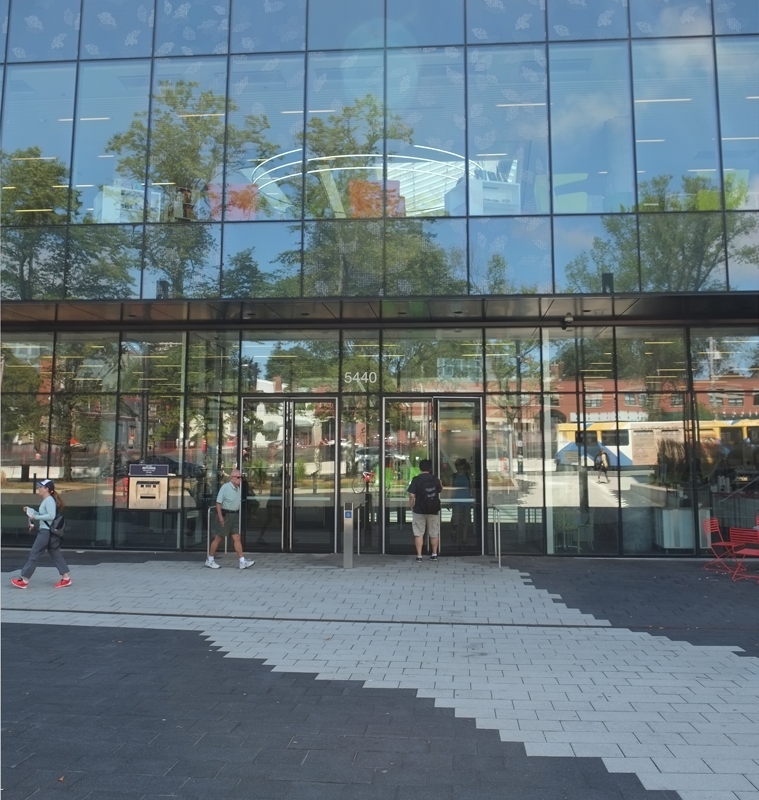 The new library looks fabulous. Hi Kathy. The old library is a war memorial to the men and women who lost their lives in WW 1 and 2. Halifax was settled by the Brits.I think WC ended up in front of the building because of his involvement in WW2. What a beautiful library! I love the modern design and that patio. The views are stunning. I hope you feel better soon. Hi Mary. Thankfully, the cold seems to be history! I agree about the library. It’s a building that makes the city proud! Hi Cat! Definitely visit when you’re in Halifax. Since it’s located to a number of major tourist attractions, it will be hard to miss. A museum in the old library is a great idea. We’ll see what happens! Nancie, I love libraries, and nowadays I love that they are in such beautiful, remarkable buildings. Great photos. I’d love to visit Halifax again someday, such a pretty city. That angle with the tree in front of the building almost makes it look like the top part of the library is balanced on the tree branches. It’s a beautiful, modern structure with a great view from the deck. I like that there’s a cafe so that you don’t have to exit to find food. I’ve always enjoyed libraries, and I think it’s interesting to see how they are changing as information and books become more available electronically. A beautiful, modern building that emphasizes there will always be a need for a public library ready to provide information and communication between people as well as a good old-fashioned read! I like the idea of the mural too, personalizing the service a library provides to its city residents. Hope this note finds you feeling better! Hi Nancie and thanks for introducing us to Halifax’s wonderful new library. It looks amazing! I love that city and would love to return. Glad to hear you’re on the mend as well. I, too, experienced an early season cold that really set me back for a couple of weeks. But am now on the mend and gearing up for future travel. Cheers! Hi, Doreen! 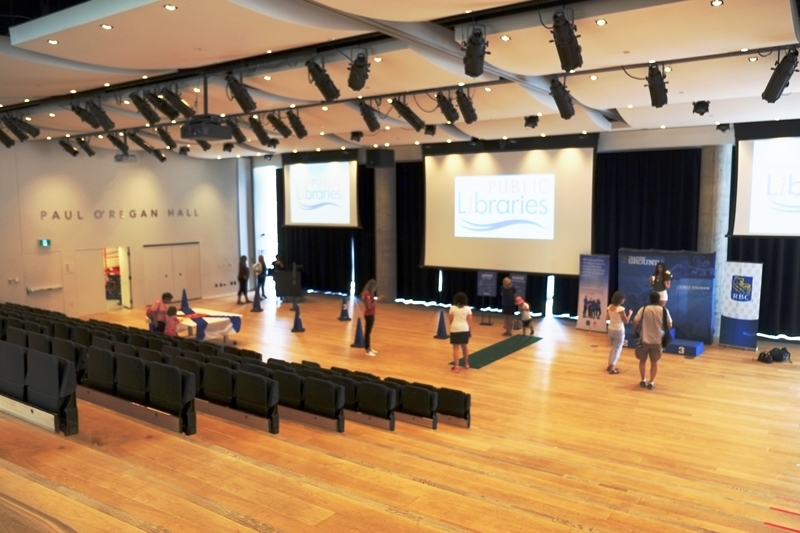 I hope you get back to Halifax one of these days and get to enjoy the library first hand. Nice to hear that you are on the mend as well. I’m hoping that this is the first and only cold that I’m going to have this fall and winter. What a fantastic place! This new library has so many cool features, including the cafes. However, I, too, hope they will find a way to utilize the old building. We admired this library from outdoors (at night) recently, and were impressed. I love parking myself at libraries as I travel, and browsing the local authors section. This building sure is attractive! Hi Kirstin1 I am so happy to hear that you found and enjoyed the new library. I was so thrilled to finally get back to Halifax, and spend some time there. I think the architects and planners did a phenomenal job! What a beautiful library and they offer so much1 I enjoyed your excellent photos! !